Block # 6 for Joanne's Thread Head Quilt Along is the Ohio Star. Thirty years ago when I was preparing to move from Wisconsin to Iowa, one of my high school friends was so excited because she would be able to stop in for a visit on her way to visit her in-laws who lived in Pennsylvania. No, I told her... you're thinking of OHIO... I'm moving to IOWA... it's west, not east. Sadly, she hasn't been able to visit me in Iowa, but I'm pretty sure she has travelled through Ohio many times on her way to visit those in-laws! Whenever I hear Ohio, I think of Jeanie and that story... it brings a smile to my face! Here is my THQA Ohio Star block. Once again, Joanne's picture instructions are top notch! I've made hourglass blocks before, but I haven't used the easy method that Joanne suggests. I think that is what I'm enjoying so much about this SAL. I'm still learning the art of quilting, and new techniques that make it easier! When I first began making the THQA blocks, I was making a Christmas fabric block in addition to the red, gold, and black theme blocks. My goal was to use only the Christmas fabric in my stash... I didn't want to buy any new Christmas fabric. What I didn't realize is that my supply of Christmas themed fabric was limited, and I didn't have very large pieces. I completed four blocks and realized I wasn't going to have much to work with to keep making more. I'll find something to do with the pieced blocks... holiday hot pads... mug mat... holiday place mat for Buddy's bowls... do you have any ideas for me? Have a great week! 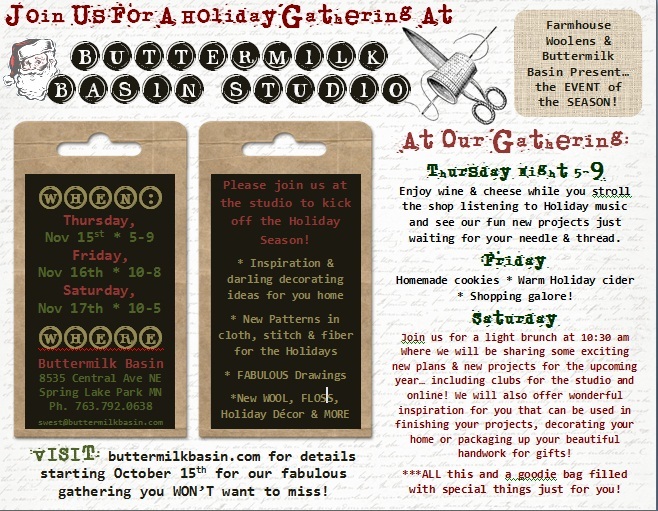 I hope each and everyone of you find time to spend with needle and thread! If there is one thing I'm sure of it's that I shouldn't sew when I'm tired. This past week was hectic, and very busy. So I kept my sewing for FNSI simple, and put the finishing touches on the little candle mat that I am making for my Mom's birthday. Once the machine quilting was done I sat comfortably in my favorite chair sewing the binding on. I quite enjoyed this simple and quiet task. It was the best way to top off a long week! It was nice to see the sun shining on Saturday afternoon! The setting was perfect for a few outdoor pictures of the candle mat and the leaf covered vase my grandchildren made for their Nana. Freshly picked fall leaves modge podged onto a glass vase. colors when a candle glows inside. My mom will think this vase is the best gift she could possibly receive for her 89th birthday! She will be thrilled knowing that the little hands of 3 of her great grandchildren helped make it, especially for her! ... I making a little something for her. What do you get for a Mom who is turning 89 years old in about 12 days? Well first off, you travel to spend a weekend with her. My Mom lives in Wisconsin, and I'm in Iowa. She knows I'm coming. Nine years ago my siblings and our families surprised her by coming home for her 80th birthday... she was so surprised, she got sick and missed the big party we planned for her. We don't do surprises anymore. I sound like adult children everywhere when I declare "I don't know what to give her! She doesn't need anything." She's the one who says she doesn't need anything. I do know she likes things that are made for her. The three oldest grandchildren and I worked on a little project for her a couple of weekends ago. (Well okay, so I ended up doing most of it. Mom/Nana doesn't have to know that!) The idea came from Pinterest - where else. It starts out as a clear, cylinder glass vase. We collected leaves from a nearby park, and the same day my two granddaughters and oldest grandson help me modge podge them onto the outside of the vase. It's important to do this shortly after picking the colorful leaves, so they retain their color. It was messy to say the least, and I think that is why the grand kids didn't last long! After several repeated coats of modge podge the idea is to put a candle inside... the flickering flame glows through the colorful leaves making it a nice Thanksgiving table decoration. In this case I'm including a battery operated flickering candle. What's important is that my Mom will think it's the greatest gift in the world because it came from the most precious people in her life. (I'll post a picture of the pretty next week). My contribution will be a small little table mat to place the candle on. I'm working on it, and it's not the fanciest, but Mom's style is simple, and she will love it. The perfect gifts for the perfect Mom/Nana who doesn't need anything! We love you! It was a Frayed Four Patch Friday a few nights ago. Block # 5 for the Thread Head Quilt Along is made up of squares and rectangles. Easy peasy... I made two. This is my favorite of the two. It won't hurt to have an extra block. I'm having so much fun making them every week, I may end up with a larger project than I originally planned! With no other commitments for Saturday, (how did that happen? ), I spent a good portion of the morning and afternoon working on my daughter's Christmas tree skirt. Naturally, my backing fabric had to be pieced... in two places. I'm okay with that... the fabric I'm using has a random, non directional design. With that finished, it was on to the batting... I was just shy (by about 2 inches!) of a large enough piece of Heirloom batting... I hated to cut into an unopened bag of the same, so I emptied my drawer of leftover pieces and found a long and wide enough strip that gave me a large enough piece to work with. I'm not sure why, but I left the paper hexies in... all 60 of them. I pinned through each of them, because I was worried about keeping the layers neatly sandwiched while I stitched around the outside edges. My good friend Nor suggested I use the edge of the paper hexagon as my sewing line. It worked like a charm! Thank heavens for experienced quilter friends! This worked beautifully! Now it's time for a phone call to my magical machine quilting friend... Hi Aimee! Were you able to spend time in your sewing room this weekend, or did hand stitching make it as a pastime for you? Let's hear all about it! Seriously? 70 days until Christmas? This is not the time to panic... not yet anyway! When I was ruffling through my basket of half completed projects, I found two that I started around this time a year ago. They are Christmas projects, and, yes, I had every intention to finish both of them for Christmas 2011. The first one is a Christmas tree skirt for my daughter and her family. I found the pattern while on retreat in September 2011. The pattern called for 36, 3 inch hexagons. I added one more row to make the tree skirt larger, so I made a total of 60 hexagons. I used precut paper shapes from here. It didn't take very long to make the hexies and sew them together, but I ran out of time when it came to adding the batting, a backing, and deciding on how to quilt it. This will be my weekend task... I need to move it along, so it will actually take it's place wrapped around the trunk of a Frazier Fur tree in my daughter's home this season. A few weeks ago on a Slow Stitching Sunday, I started making my 2012 Christmas ornaments for each of my 4 grandchildren. I'm using 3/4 inch hexies for these. They are coming along... I'm still workin' on how to finish them... I have a few ideas floating in my head. At some point I'll just have to grab one of the floaties and go with it! I have the next block for THQA to cut and piece. Joanne is being real easy on us with this one... will post pictures when it's done! Wouldn't this be a fun road trip! 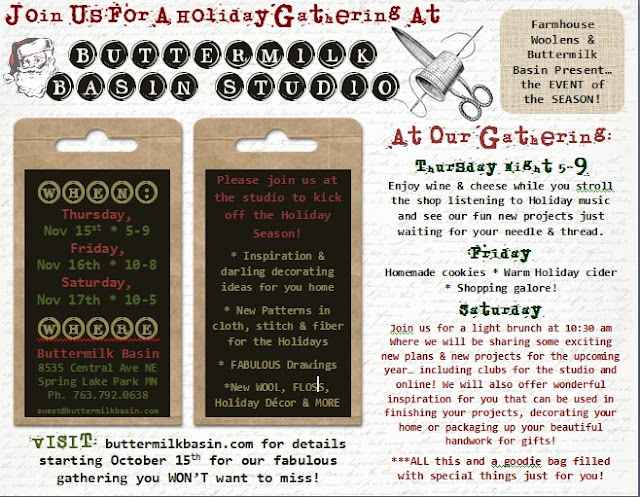 Visit Buttermilk Basin for details on A Holiday Gathering Open House! I can't tell you how much I look forward to Tuesday mornings... before I leave for work I absolutely must check Joanne's blog to see the quilt block she has chosen for the Thread Head Quilt Along 2012... it's a Bear's Paw for week number four. In addition to the Bear's Paw, I made another week two block, Churn Dash. I'm liking the contrast in this block sooooo much more! The more I looked at the first block I made, the more I didn't like it, but I didn't want to discard it altogether. So I took the original block apart with my trusty seam ripper, and changed the center block to the same fabric I used for one half of the HST corner blocks. I think it's the large print fabric in the center that bothered me! Churn Dash block after the re-do! I like it much better, but I don't think the picture shows the improvement! Here are the 4 blocks along with the extra Churn Dash block that I have. I can't wait to see block # 5, 6, 7... and more! And to think when I'm done I'll have completed something larger than a mini quilt! There's joy in that thought alone! A week after attending the AQS show in Des Moines, I finished making a cute candle mat featuring a patched pumpkin, and a Goose Track quilt block. The Crazy Pumpkin Candle Mat pattern is from Farmhouse Threads. The pattern calls for assorted orange wool scraps. When I checked my bin full of wool I realized I didn't have a selection of orange scraps or pieces to chose from. How did that happen? And to think one week ago I was walking up and down the aisles of one huge quilt shop... the AQS show... how did I not know I needed orange wool? What's a girl to do? Oh, yes... check the wool felt bin... I'm saved... I make changes... and the results are just as satisfying! The pumpkin in the pattern was also embellished with buttons and more embroidery, but I opted to keep mine plain. I kept the quilting on the block simple as well. I was lucky enough to add a few other fall decorations to my existing display. Carole, a fellow member of the Threads quilt group and our resident expert embroiderer, made this little treasure for me. An embroidered cutie from Carole! Carole is famous for giving cuties like this away as a flimsy, with a note attached that says, "quilt or finish as desired." I added thin batting, backed it with a cotton print, and finished it to resemble an old Halloween postcard. I love it! Thanks, Carole! I saved the best for last... my 9 1/2 year old granddaughter is teaching herself the art of origami. Over the past several weeks she has been checking out library books on the subject, and shapening her techniques. (This is the same granddaughter who, at age 6, checked out a book from her school library entitled, "Teach Yourself to Speak German." She's a bit of an over achiever... however when she was giving me examples of what she was learning, it sounded more like Japanese...). Anyway, while visiting her one evening last week, she made a mini Halloween wreath in her favorite trick-or-treat colors, and attempted to teach me how to make a black cat. All the while we were making these out of construction paper, she was telling me that she was out of origami paper... and her birthday is in November. I can take a hint. Sophie's special creations for Gamma's Autumn display! The cat and the wreath are among my favorite seasonal decorations! They make me smile! ... this is a public service announcement... and you've heard it all before. October is BREAST CANCER AWARENESS month. This is a friendly reminder for you to have your annual screening mammogram. And, do your self examination once a month. I'm a mammographer. Yes, I'm one of those ladies that you are supposed to visit annually for the all important mammogram. I'm one of those ladies who you would rather not see once a year. But we've all heard the stories... mothers, sisters, daughters, grandmothers, aunts, cousins, friends, neighbors, co-workers... is there anyone who doesn't know someone with breast cancer? Really the exam isn't so bad. A few minutes of discomfort, that's all you have to put up with. Not much to show in the sewing department. I spent Saturday at a local Pumpkin Fest with my kids and grand kids. It was a chilly 47 degrees at the highlight of the day! But we bundled up and enjoyed watching the little ones paint pumpkins, decorate sugar cookies, take pony rides, and marvel at the makings of a balloon magician. It was great fun! I'm hosting the Threads Quilt Group at my home on Monday night, so I thought it would be nice if I did a little cleaning. Never mind that it cut into time spent in the sewing room! I'm so thankful that none of them will arrive wearing white gloves! Managing a few stolen moments from the vacuum and duster, I was able to piece my THQA week three blocks. This is my first quilt-along. Not only do I enjoy piecing the blocks that Joanne has selected, but I enjoy the pace of one block pattern a week. It's manageable with my work schedule. I'm so glad I stumbled on Joanne's blog when I did! Hope everyone has a productive week of sewing! ... that's the name of block #3 for the Thread Head Quilt Along. I love it, because Joanne has selected a block that I have not made before. My two blocks are cut out and waiting for me to piece together. I'm lovin' em! Read all about Joanne's THQA here. An afternoon just wasn't enough, but it was all the time Carole, Nor, and I had to visit the AQS show in Des Moines this afternoon. The quilts on display are magnificent... but time just didn't allow for us to see them all! I must admit I'm primarily there for the vendors... such a great opportunity to get a glimpse of what's new, meet a few of the designers, and support the quilt shops that come from all over the Midwest (and further!) to display and sell what every quilter needs... more patterns, more fat quarters, more charm packs, more wool, more rulers, needles, cutting tools, and other various gadgets, etc., etc., etc.!!! It was heaven! We walked into the grand hall, and turned to our left to start at the beginning, if there is such a thing at these shows! It would be easy to just run a muck! Along the way we marvelled and admired the quilts on display. Magnificent! That's the best way to describe them! It probably took us an hour to get down row one... mostly because of the booths like this one... Linen Closet Designs. Dawn Heese of Linen Closet Designs - friendly, personable... not to mention a beautiful booth! This beauty caught both Nor and Carole's eyes. (Well mine too, but I know my time limitations...). They bought the pattern with the intention of it becoming an "after the first of the year" project. (I've heard that before!). The picture does not do it justice. The colors and fabrics are just wonderful. Thank you Dawn, for allowing pictures of your booth! I appreciate it, and so do many other quilt bloggers! Visit Dawn here. Be sure to check out her new book, "Inspired." Perhaps you've read about it in blog land the last couple of weeks! Many of the vendors do not allow photos of their booths, or of the display models, patterns, kits, etc. in their booths. Some allow photos of a model if you have purchased the pattern and/or the kit. Such is the case of Yellow Creek Quilt Design of Pearl City, IL, and I thank them. This was one of my favorite booths! Lots of models, patterns, and kits that appeal to what I like! The book is Christmas Favorites by Art to Heart - BELIEVE is the project I aim to do! The kit the shop owners put together is what caught my eye! LOVE the darker fabrics, and love the black frame! Really? Another project? And I can just hear my daughter, and daughter-in-law... "will you make one for me, too?" (I shall remain non-committal at this time... but I'm sure I can be talked into it...). Visit Yellow Creek Quilt Designs here. Another favorite booth that happily allowed pictures, ... Red Button Quilt Co., from Bemidji, MN. Lots of goodies in here! And helpful ladies keeping us in line! The Threads quilt group was happy to hear that this shop is about a forty minute drive from our annual fall retreat in Northern Minnesota. Road trip September 2013! Visit their website here. Quilting pal Carole purchased the pattern and kit pictured below. The flowers are made with some of the tiniest buttons I've ever seen! Baby Steps from Red Button Quilt Co.
...the booth model... once again, the picture doesn't do it justice. I love the model... that's what sold me on the pattern! We enjoyed visiting Primitive Gatherings... we didn't see Lisa, but her husband Nick seemed to have everything calmly under control. Lisa's booth is one of the best every year... and so organized. All the models are tag with a number... you simply have to go to one side of the booth to find the bin matching the number, and you will find the pattern, the kit, and sometimes the fabric that they used, in the bin. There is so much eye candy in this booth, it is truly a treat! And if you like quilts with tiny, tiny, stippling, this was the place to find them! Thank you, Primitive Gatherings, for coming again this year! We did miss seeing a few other favorite vendors that have attended in the past but didn't attend this year... Jan Patek, Sew Unique Creations, and Country Threads come to mind. It's understandable... it must be nice for these busy ladies to stay home once in a while too! They are kept plenty busy throughout the year, that's for sure. And, if they're not at the Des Moines show, it must be because they are back home designing more fabulous projects for all of us! Fall fat quarters, over dyed rickrack, 60 degree diamond template (for a January project), "Believe" fabric kit, Art to Heart book, Primitive Gatherings 2.5" light & dark reproduction prints, and their famous wool applique needles, more fat quarters, a Friendship charm pack, and a couple of fat eights of wool! ... dang, I had fun!!! Yep! After pacing back and forth in front of my TV while watching the Green Bay Packers almost lose another close one, I needed something to calm my nerves. Ahhhh, my sewing room! Last week I posted pictures of the two Churn Dash Blocks I did for week two of the Thread Head Quilt Along. I was happy with the red and gold block, but the Christmas block just didn't speak to me. Well, I made another one and I'm much happier with the results! It really is red, creme, and green... in the picture the green looks more like blue. Maybe I'll end up using the first block I made... at least I will have two to choose from! I look forward to seeing the accomplishments of other bloggers from a weekend of stitching! Happy sewing days this week to all of you!